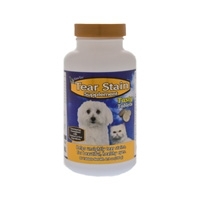 Tear Stain Supplement Tablets are formulated to help eliminate unsightly tear stains from the inside out. Our natural active ingredients of Cranberry Extract and Calcium Ascorbate help support the immune system, Marshmallow Root helps lubricate mucous membranes and Oregon Grape Root is a natural anti-microbial. All together they will give your pet healthy, beautiful eyes.